The definition of dramedy: The Reluctant Journal of Henry K. Larsen by Susin Nielsen | Shelf Elf: read, write, rave. I’ve been in a reading rut the past couple of months, and Susin Nielsen’s The Reluctant Journal of Henry K. Larsen is one of the books that finally pulled me out of it. If you haven’t read it, don’t wait. It is both heartbreaking and funny-bone-tickling – and when I tell you what it’s about, you’ll probably find the promise of funny hard to believe. Thirteen-year-old Henry and his family face the unthinkable when his older brother Jesse takes his father’s hunting rifle to school one morning and kills the bully who has been making his life a living hell for months. Henry’s family moves to a new city in an attempt to “start over” and there Henry begins seeing a therapist. The therapist wants him to keep a journal. At first Henry thinks this is stupid. Eventually, the journal becomes a place for him to share his thoughts about his new situation, including what he thinks of the oddball group of nerds he finds himself hanging out with at school, and his new neighbours in their apartment building. Henry tries as hard as he can to make sure what happened to his family stays a secret, but it isn’t easy keeping something so awful and life-changing in the past. It’s Henry’s voice that really gets you and makes this book memorable. Nielsen excels at capturing the mix of emotions Henry feels – crushing sadness and guilt and anger – but she also makes it clear that Henry is a pretty hilarious boy. I loved how Henry speaks in “Robot Voice” when his therapist (or anyone else) tries to get him to talk about anything painful. It is funny, but also incredibly touching, because it’s something so true to what a kid would likely do to protect himself emotionally in such a situation. You can tell that Henry is one bright kid. I also appreciated that Nielsen doesn’t gloss over the hard stuff in this book. She makes you think about whether or not you’d be like the people in the community who shut out Henry’s family after this tragedy. She makes you sympathize with Henry when he goes to visit the victim’s sister and her dad turns Henry away, horrified, at the same time as you kind of understand where the father is coming from in the moment. Nielsen doesn’t sugar coat, but there is nothing inappropriate in the content for an intermediate reader. She handles the subject matter with perfect sensitivity. I think kids and adults will appreciate her honest but thoughtful scrutiny of this mature and intense topic. The Reluctant Journal of Henry K Larsen is a book that should make you think about stories you’ve heard in the news a little bit differently. It’s very sad in places, but I promise, there will be moments when you laugh out loud. In my opinion, it takes a unique writer to offer readers such great dramedy. 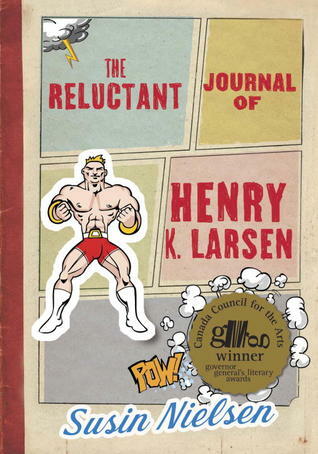 The Reluctant Journal of Henry K. Larsen is published by Tundra Books. This entry was posted in Can-Con, Teacher Titles, Teen/YA and tagged bullying, school violence, Susin Nielsen, therapy, Tundra Books, wrestling on June 10, 2013 by shelfelf.